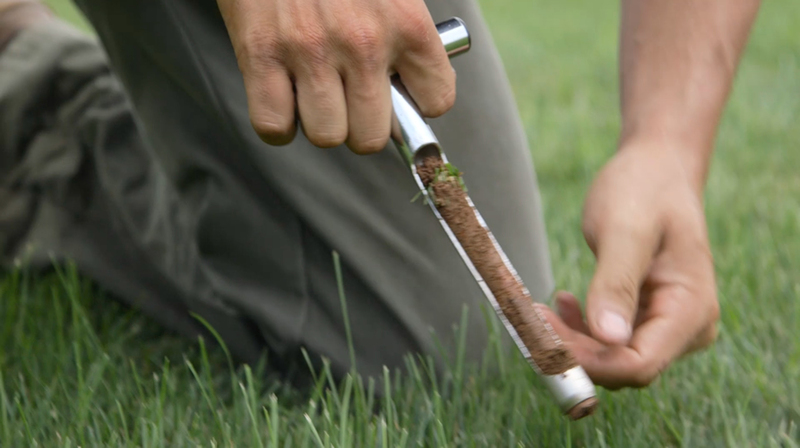 Soil testing allows us to evaluate any special needs your soil may have. We look at PH, organic matter and calcium/magnesium ratios to determine soil chemistry, nutrient availability and overall soil health. Recommendations can then be made to correct any deficiencies. Organic First knows that no program can control every situation. Weather and other events can interfere with your lawns appearance and health. If this happens we will be there to provide you with answers as to why things may have went wrong and to see what can be done to correct and hopefully eliminate them from happening again. When there is no organic alternative to a given pest or problem a chemical alternative can be discussed and applied only with your approval. If you have a previously established lawn and have been contemplating new sod or roto-tilling to bring it back to life, consider overseeding instead. For a fraction of the cost of sod, you can have a lawn with significantly more advantages than sod. Over seeding is the process of planting grass seed directly into existing turf, without tearing up the turf or the soil. An investment in over seeding pays off with a thicker, more beautiful lawn. Most sod growers advise to overseed every two years to keep fescue lawns thick and healthy, and to avoid the expense and disruption of re-sodding a yard. All-in-one aerating and seeding can help to improve density and fill in thin or bare areas; improving water, air and nutrient movement thru-out your lawn while reducing soil compaction and thatch build which are 2 major causes of many lawn problems.